Lift range form 10 5/8" to 32". The GP660 Lift Table Cart is ideal for lifting cargo and items with ease. Lift and lower heavy loads for smooth, easy loading and unloading! Ideal for transporting shop machinery, large tool boxes and cargo too heavy to lift manually. Additional uses: Loading and unloading cargo from vehicles. Stocking shelves without any bending. Work on engines or other machines at a comfortable and convenient position. Many professional have come to depends on the GP660 for the solid state construction and high quality performance. Purchased this lift table to place a phototherapy machine on. I need the machine for treatment of psoriasis on my hands and feet. There was no way I could move that machine on and off a table. 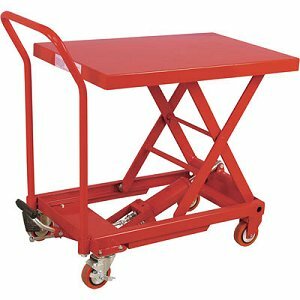 I did a lot of searching online and felt your lift table would be something that might solve my problem. I'm very happy with my choice. It fits my needs and is a quality constructed product. Fast ordering and delivery. Wonderful product. I will make special effort to integrate other Hand Trucks 'R' Us products in to as many applications as possible. Save your back...save time...use these products.